The beautiful Toronto skyline continues to grow and shape the city. From world class attractions such as the CN Tower, to the new award winning Absolute Towers, also known as the “Marilyn Monroe Towers,” Toronto showcases some of the most unique buildings in the world. Behind every door lies a story. Doors Open Toronto is a free annual event that will be running in its 14th year on May 25 and May 26, 2013. The special event invites visitors into properties that are either not usually open to the public, or would normally charge an entrance fee. Visitors can enjoy special programming, tours and interactive events in more than 135 of the most historic, cultural and beautiful buildings this city has to offer. Download the Open Doors Toronto mobile app to help you guide your way. The CN Tower: Built in 1976 by architect group WZMH Architects, the CN Tower stands 553.33 m tall and was built as the world’s tallest free-standing structure and world’s tallest tower at the time. It holds two restaurants one of which spins 360 degrees. It also features an observation deck with a glass floor, and a recently added Edge Walk attraction. The Distillery District: Originally built in 1859 as a manufacturing district, in May 2003 The Distillery District was reborn and re-opened – but still maintained its 1859 look. The Distillery and its more than 40 buildings were transformed it into a pedestrians-only village entirely dedicated to arts, culture and entertainment. 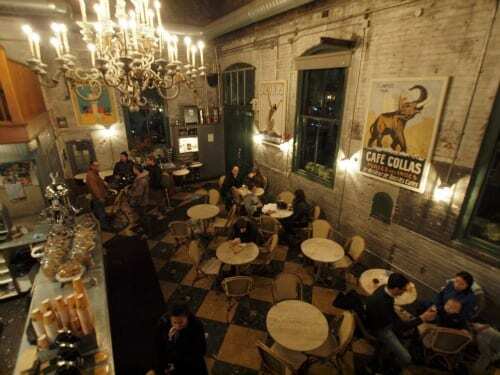 The Boiler House: Originally built in 1886 as a power plant, in 2003, the building was transformed into an award-winning restaurant by architect Mackay Wong. All the major structural elements were retained. Celestin Restaurant: Originally built in 1920 as a bank, the building now stands as a beautiful and unique restaurant. The Rogers Center: Built in 1988, the then “Skydome” was the first stadium ever to have a fully retractable motorized roof. It was later renamed the Rogers Center but still remains home to the MLB Toronto Blue Jays baseball team and the CFL Toronto Argonauts football team. Casa Loma: Built in 1914 by architect E.J. Lennox, Casa Loma now stands as the city’s only castle and one of its most famous attractions. 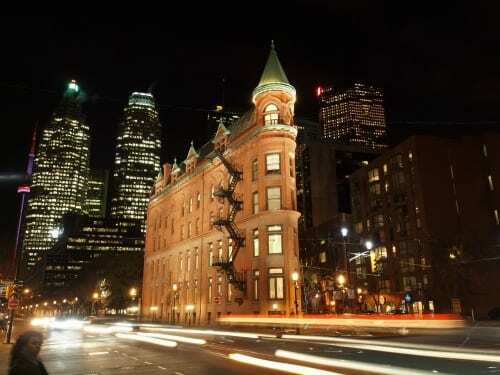 Gooderham Building: Built in 1892 by architect David Roberts Jr. as Toronto’s “Flatiron Building” it was built a decade before New York’s more famous Flatiron Building. Old City Hall: Built in 1899 by the same mind behind Casa Loma, architect E.J. Lennox. Absolute World Towers: Built in 2012 by architect firm “MAD” from Beijing, China. The award winning towers are locally known as the Marilyn Monroe Towers for their unique curvy design. Sharp Centre for Design (Ontario College of Art & Design): Built in 2004 by architect Will Alsop, this award winning building has been deemed one of the strangest buildings as it stands on stilts. 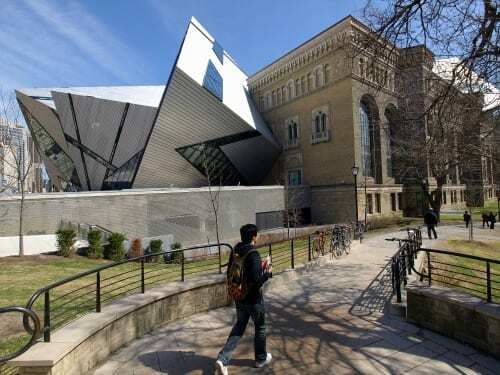 The Royal Ontario Museum: Originally built in 1914 by architect firm Chapman and Oxley, the museum added a unique crystal looking wing to the building in 2007 by architect Daniel Libeskind. Scadding Cabin: Built in 1794 by the Queen’s Rangers for John Scadding, it is Toronto’s oldest surviving house. Thomas Fisher Rare Book Library: Built in 1973 by architects Mathers and Haldenby, the interior is an impressive and dramatic sight. Five mezzanine floors, with rare books lining the perimeter, overlook an exhibition area and twin reading rooms on the ground floor. The Art Gallery of Ontario: Frank Gehry was the architect leading the design that transformed the Art Gallery of Ontario into something incredibly special. The project which started in June 2005 and was completed in 2008. 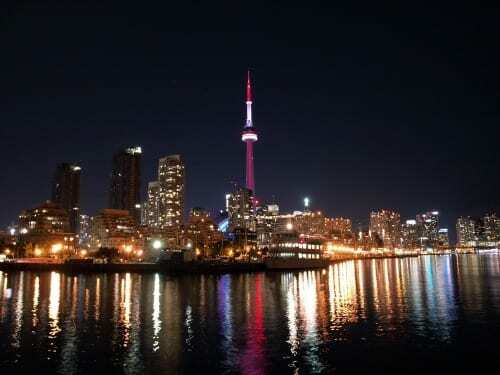 This is a guest post from our friends, and TBEX 13 host destination, Toronto Tourism. All photos are used with their permission. Just wanted to correct a couple of mistakes in your post. 1) Art Gallery of Ontario: the architect’s name is actually spelled Gehry, and the project was completed in 2008 — not 2014 as stated. 2) Absolute World Towers are not located in Toronto and therefore cannot be seen on the Toronto skyline. They are located in Mississauga, a separate city altogether to the west of Toronto. 3) The Distillery District wasn’t a manufacturing district, but an actual distillery district where whiskey and other spirits were distilled. Just wanted to correct a couple of factual errors in the post. The Absolute Towers are not visible on the Toronto skyline because they are not even in Toronto at all — they are situated in the City of Mississauga, which is located west of Toronto. 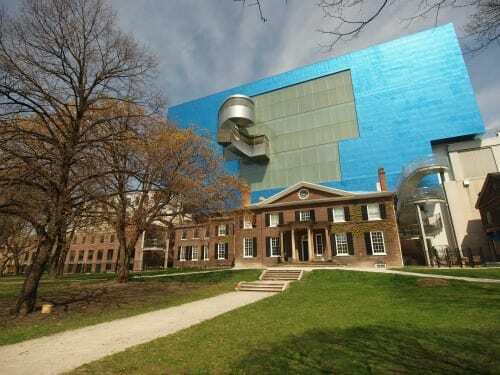 The Art Gallery of Ontario transformation was designed by architect Frank Gehry (note the spelling) and it was completed in 2008, not 2014 (the new building opened to the public in mid-November of 2008, to be precise). Finally, the Distillery District originally was the site of a windmill, not a manufacturing district, and quickly developed into the world’s largest distillery for whiskey and other spirits. I love looking at the Royal Ontario Museum. I think the design is super interesting. It is definitely a combination of the old and modern.